See the attached for additional information. What are your ideas for the improvements of Westboro Beach? This project is part of the Ottawa River South Shore Riverfront Park Plan, which aims to reconnect people and communities to the Ottawa River. The plan includes over 200 hectares of riverfront lands between LeBreton Flats, the mouth of the Pinecrest Creek corridor and the Mud Lake Conservation Area. The Westboro Beach area redevelopment project will be one of the first steps in making this plan a reality. Join us for a workshop discussion by filling out the form by clicking here. Book early. Space is limited. Please RSVP by noon on Friday, April 26, 2019. 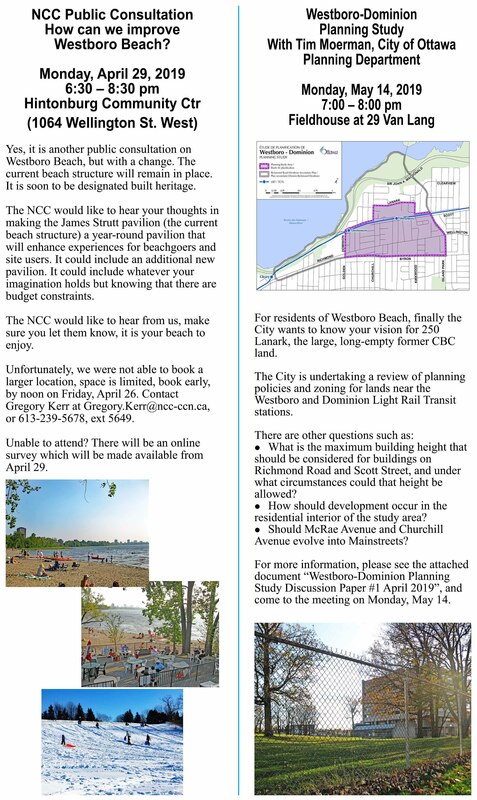 Please share your thoughts and preferences regarding the future design of Westboro Beach by responding to the online survey that will be available here, from April 29, 2019 to May 13, 2019, at midnight. We are excited to announce our first Kitchissippi Ward Forum for Jeff’s second term of Council is coming up in a few weeks. As always, this is an opportunity to the community to come together to discuss key issues within the Ward, collaborate, and get updates from our various community stakeholders, as well as from our office. This time, we are focusing on temporary traffic calming. In Kitchissippi Ward, we hear often from our residents about traffic concerns. Temporary traffic calming is a tool we can use to mitigate those concerns. City staff will be making a special presentation on what temporary traffic calming is and how it works. Feel free to join the Facebook event group! We looking forward to connecting and chatting with you further. The Rideau Branch of the City of Ottawa Archives presents 2 FREE programs designed to provide practical information and ideas for researching, organizing and preserving cherished family history and memories. When: Saturday, April 6, 10-12 a.m.
to answer your questions and offer practical information and advice on interpretation and preservation. When: Saturday, April 6, 1-3 p.m. The Digital Records Archivist at the City of Ottawa Archives will present strategies for long-term home preservation of your valued digital images. The volunteers and staff of the Rideau Archives gratefully acknowledge Friends of the City of Ottawa Archives/ Les Amis des Archives de la Ville d’Ottawa, and the City of Ottawa Archives for their program and financial support. Message from Ecology Ottawa: Are you #GenerationClimate? I’m writing to you today to let you know about a new program we’re launching at Ecology Ottawa that I’m incredibly excited about. Throughout the entirety of 2019, and into 2020 we’ll be training and mentoring 40 young people from all across the city of Ottawa to be Youth Climate Ambassadors. The program is being executed with help from our amazing community partner organizations: Just Food, OREC, Healthy Transportation Coalition, The Ottawa Greenspace Alliance, Climate Action Network Canada, the Peace and Environment Resource Centre, and Sustainable Eastern Ontario. Throughout each Youth Ambassador’s time in the program, they’ll be exposed to teachings from each of these amazing organizations, with an additional in-depth mentorship lasting 20 hours to round out our ambassadors’ knowledge of local climate action. To kick-off the Youth Climate Ambassadors program we’re hosting our launch event “Generation Climate” at the Shaw Centre on March 27th. The event, taking place from 7:00 to 9:30 is open to people of all ages, and exists to showcase how young people in Ottawa are already taking action on climate and making big changes in our city. With this event we’re hoping to excite and inspire young folks from our community to get involved, and mobilize to build a city we can be proud of. Will you join us at our launch event “Generation Climate” on March 27th? Click here to RSVP! Interested in becoming one of our Youth Climate Ambassadors?Learn more about the program and apply here. Our first cohort meets for training on March 30th and 31st! P.S.Our friends at OREC are starting up a new member-driven co-operative based in Ottawa. For a limited time, interested individuals can invest in local energy efficiency projects through CoEnergy. Go to coenergy.coop/invest for more details. Je vous écris aujourd’hui pour vous faire part d’un nouveau programme que nous introduisons à Écologie Ottawa qui m’excite beaucoup. À travers toute l’année 2019, et jusqu’en 2020, nous ferons la formation et le mentorat de 40 jeunes venant de partout à Ottawa (Jeunes Ambassadeurs pour le Climat). Nous administrerons le programme avec l’aide de nos excellents organismes communautaires avec lesquels nous travaillons en partenariat : Just Food, le CÉRO, Healthy Transportation Coalition, Ottawa Greenpeace Alliance, CAN-Rac, le Centre de ressources pour la paix et l’environnement, et Sustainable Eastern Ontario. Durant la période d’affectation de chaque Ambassadeur au programme, ils profiteront de l’enseignement de ces organismes fantastiques, et ils recevront 20 heures additionnelles de mentorat en profondeur pour augmenter leurs connaissances des enjeux climatiques locaux. Pour introduire le programme de Jeunes ambassadeurs pour le climat, nous organisons notre évènement de lancement ‘Génération du climat’ au Centre Shaw, le 27 mars. L’évènement, qui se tiendra entre 19h et 21h30 est ouvert aux gens de tout âge, et veut démontrer comment les jeunes de la ville d’Ottawa s’activent déjà en matière de climat et comment ils apportent des améliorations majeures à notre ville. Nous espérons, par cet évènement, exciter et inspirer les jeunes de notre communauté à s’impliquer et à se mobiliser pour construire une ville de laquelle nous serons fiers. Nous vous invitons à vous joindre à nous pour notre évènement de lancement ‘Génération du climat’, le 27 mars. Cliquez ICI pour accepter notre invitation. Êtes-vous intéressés à devenir un Jeune ambassadeur pour le climat? Apprenez à mieux connaitre le programme et faites une demande ici. Notre premier groupe de participants se rencontrera les 30 et 31 mars pour la formation. P.S. Nos amis à OREC lancent une nouvelle coopérative basée à Ottawa et dirigé par ses membres. CoÉnergie encourage les gens à diversifier leur portefeuille sans nuire à la planète, et à apporter un changement positif dans leur communauté. Visitez coenergy.coop/invest pour en apprendre plus. 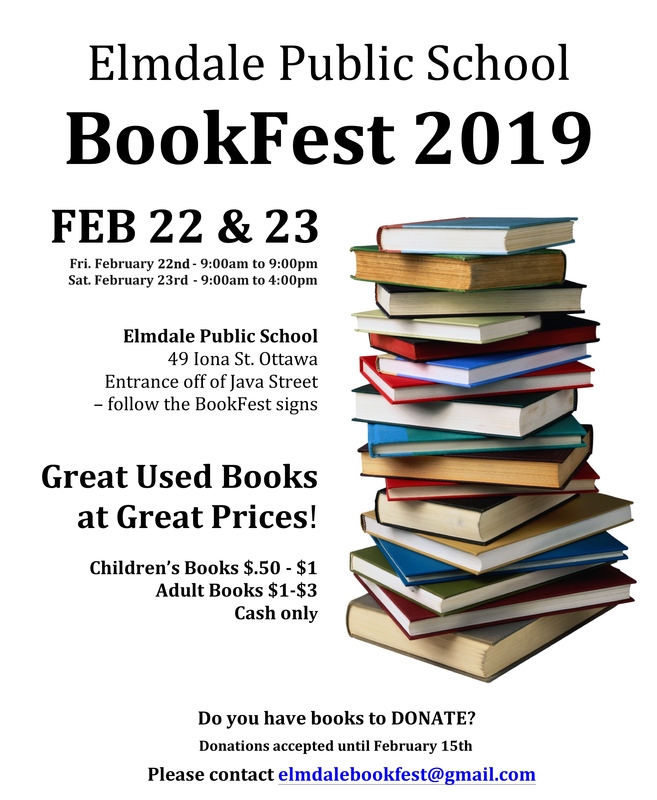 BookFest, Elmdale Public School’s iconic annual second-hand book sale, is an opportunity to find a great read while supporting a good cause. With more than 25,000 titles there’s something for everyone, all at very low prices (cash only). Complete with raffles and a bake sale. BookFest 2019 will take place in Elmdale Public School’s gymnasium (49 Iona St. – enter from Java St.) on Fri., Feb. 22, 9:00am to 9:00pm, and on Sat., Feb. 23, 9:00am to 4:00pm. For more information email: elmdalebookfest@gmail.com.